In 1964 the Senate Committee on Aging reported that “once admitted to an institution ... the veteran begins ... to show signs of social and physical degeneration,” a phenomenon that has not escapted the attention of clinicians, social scientists, veterans, and other chronic-care patients. Assuming that social withdrawal in the institutional setting was avoidable ad that a strictly medical model of chronic care was inappropriate, Lella and his collaborators established a patient-government project designed to give thirty elderly men in a large veterans’ hospital, who suffered from various degrees of social withdrawal, an opportunity to express their individuality and independence and to shape institutional decisions. 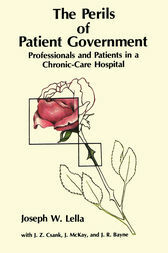 The Perils of Patient Government goes well beyond a description and analysis of the projects’ successful side—a general improvement in the lives of the veterans on Ward 23; it also exposes and analyzes the project’s failures, portraying negotiation and conflict among change-oriented and conservative staff of varying professional identities, ideologies, and career strategies. While struggling over the idea and practice of patient self-government, nurses, and other professionals did make progress but also set severe limits on what patients could achieve for themselves. As well, Lella’s study tackles the larger question of how change affects organizations and institutions. Lively and well-written, this is an enlightening work for students of gerontology and geriactics, for professionals and para-professionals, administrators, and policy-makers involved in chronic care, and for researchers probing the fields of medical sociology and institutional organization.